HOUSTON  (April 21, 2009)  Declines in the sales and pricing of homes throughout the greater Houston area eased in March, matching a trend that the Federal Reserve noted in several markets around the country in its Beige Book survey released last week. Overall March property sales fell 18.9 percent and sales of single-family homes dropped 16.1 percent versus March 2008, according to new monthly data prepared by the Houston Association of REALTORS® (HAR). However, from February to March of this year, overall property sales volume increased 26.1 percent while sales of single-family home rose 27.8 percent as we enter the spring and summer seasons, a period that traditionally produces higher sales volume than the fall and winter months. At $145,000, the March single-family home median price  the figure at which half of the homes sold for more and half sold for less  fell 4.4 percent year-over-year, but still attained its highest level of 2009. When foreclosures are removed from the analysis, the median price of traditional single-family homes was flat at $168,000. The average price of a single-family home in Houston dropped 6.0 percent last month to $193,880 compared to March 2008. The median and average price declines mark the smallest drop since levels first turned negative last October. While sales of foreclosure properties, which typically sell below market prices, continued to weight home prices last month, the effect was milder than in previous months. In March 2009, foreclosures made up 24.5 percent of all single-family home sales in the Houston area compared to 34.0 percent in January and 28.0 percent in February. The median price of March foreclosure sales reported in the MLS tumbled 11.3 percent from $94,700 to $84,000 on a year-over-year basis. Sales of all property types in Houston for March totaled 5,022, off 18.9 percent compared to March 2008. Total dollar volume for properties sold during the month was $940 million versus $1.2 billion one year earlier, a 23.2 percent decline. Demand for rental properties rose again in March, with leases of single-family homes up 4.3 percent on a year-over-year basis and leases of townhouses and condominiums up 26.6 percent. Leases of high rise units rose 82.0 percent, a figure that tends to be more variable because of the comparatively small number of units involved. Its too soon to predict exactly when the Houston real estate market will be in healthier territory, but the recent moderation in sales and pricing trends is an encouraging sign, said Vicki Fullerton, HAR chair and broker of record at RE/MAX of The Woodlands & Spring. For consumers with good credit, this is an outstanding time to buy a home in the greater Houston area because mortgage interest rates are at 50-year lows and theres a plentiful supply of reasonably priced housing inventory. First-time home buyers also have until December 1st to take advantage of an $8,000 tax credit that does not require repayment, she added. The month of March brought Houstons overall housing market negative results when all listing categories are compared to March of 2008. Total property sales and total dollar volume fell, as did average and median single-family home sales prices. However, the number of available properties, or active listings, at the end of March fell 12.4 percent from March 2008 to 45,768. That is 1,021 more active listings than February 2009 and regarded as an indication that inventory levels remain balanced. Month-end pending sales  those listings expected to close within the next 30 days  totaled 3,711, which was 19.1 percent lower than last year and suggests the likelihood of a decline in sales when the April numbers are compiled. The months inventory of single-family homes for March came in at 6.1 months, down 3.6 percent from one year earlier. The national months inventory of single-family homes remained flat at 9.7 months, according to the National Association of REALTORS® (NAR). At $193,880, the average sales price for single-family homes dropped 6.0 percent from March 2008, when it was $206,301. However, the figure is at its highest level since last September. The median price of single-family homes in March was $145,000, off 4.4 percent from one year earlier, and equal to its December 2008 level. The national single-family median price reported by NAR is $164,600, illustrating the continued higher value and lower cost of living that prevail in the Houston market. March sales of single-family homes in Houston totaled 4,355, down 16.1 percent from March 2008, and accounted for the 19th consecutive monthly drop. Year-over-year sales of single-family homes priced at $80,000 and below rose 20.1 percent in March, buoyed by foreclosure-related transactions. 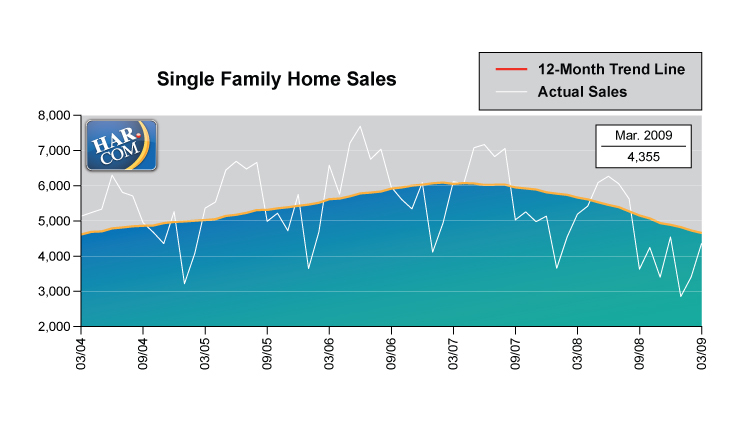 HAR also reports existing home statistics for the single-family home segment of the real estate market. In March 2009, existing single-family home sales totaled 3,624, a 13.4 percent decrease from March 2008. At $178,477, the average sales price for existing homes in the Houston area fell 5.5 percent compared to last year. The median sales price of $133,000 for the month was down 4.9 percent from one year earlier. 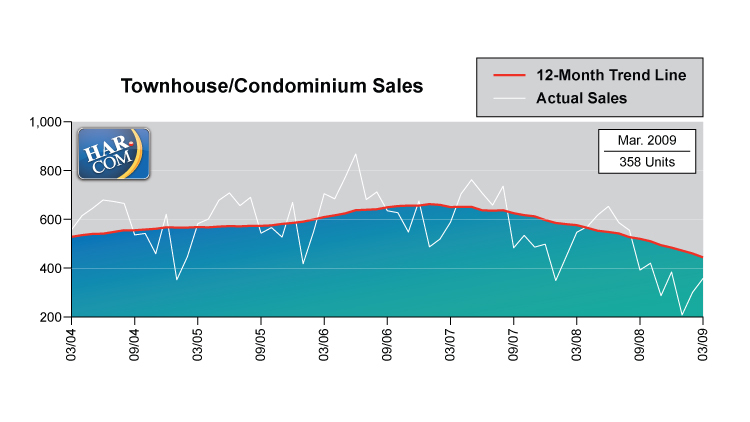 The number of townhouses and condominiums sold in March fell compared to one year earlier. In the greater Houston area, 358 units were sold last month versus 547 properties in March 2008, translating to a 34.6 percent decrease in year-over-year sales. The average price of a townhouse/condominium dropped to $159,733, down 10.4 percent from one year earlier. 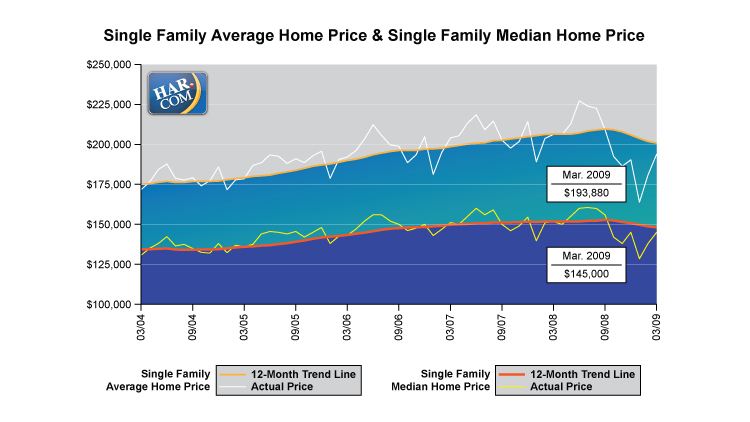 The median price dipped 4.7 percent to $134,000 from March 2008 to March 2009. Demand for single-family rentals increased again in March. Single-family home rentals rose 4.3 percent last month compared to a year earlier. Year-over-year townhouse/condominium rentals rose 26.6 percent and rentals of high rise properties leapt by 82.0 percent. The latter figure has a tendency to be more variable because of the comparatively small number of transactions in that housing category. Active listings fell 12.4 percent, representing a generally balanced supply of housing inventory.